From now until December 18, 2017, you can enjoy the benefits of our Great Unicorn Leader’s infinite mercy without the need for any Goodie Two Sleeves Coupons! For every t-shirt you order, you will get another t-shirt of equal or lesser value for FREE! Long live our Unicorn King! Find the world’s best clean funny t-shirts, music tees, novelty licenses, and accessories in the world! Plus, spend $25 and get a free Holiday Gift Pack of assorted accessories valued at over $15! Visit the SALE section for even more awesome savings! The Shirt List will try to keep you up to date on Goodie Two Sleeves coupons, discounts and sales here. 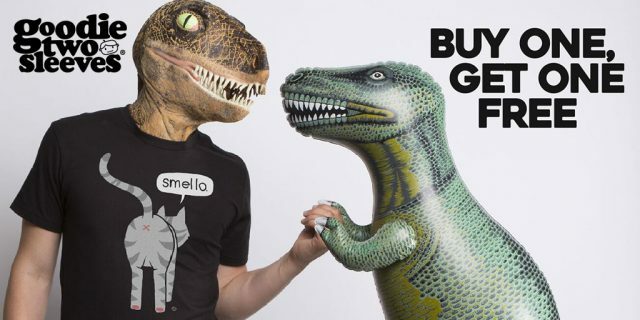 Use your Goodie Two Sleeves coupons to buy some of the cutest family-friendly t-shirts on the planet. Goodie Two Sleeves claim to have the best discount t-shirts and funny t-shirts on sale this side of the Internet! Whether you need cheap t-shirts or on sale t-shirts, they’ve got you covered! Covered in funny t-shirts at a great value, that is! Awesome t-shirts are hard to find and Goodie two Sleeves makes the best! You are almost sure to find one that suits you.